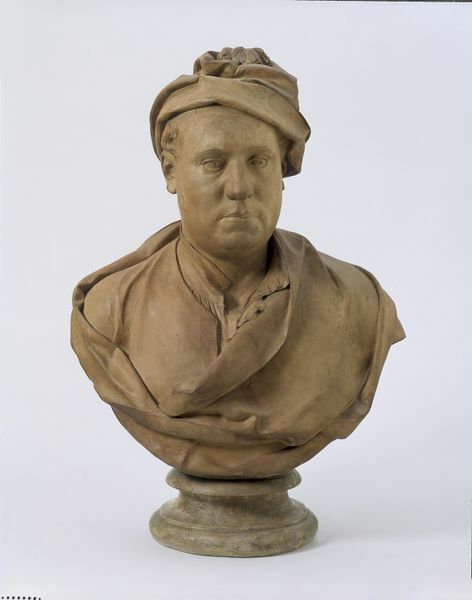 This is probably a model for the marble bust of Jonathan Tyers now in the City Museum and Art Gallery, Birmingham, although the quality of the carved marble looks inferior to the terracotta and may have been undertaken by associates in Roubiliac's workshop. Sculptors often worked in clay initially, which was then fired to become terracotta, and this example was almost certainly modelled from the life. This terracotta and the marble version were almost certainly commissioned by Tyers himself, who had employed Roubiliac to produce the full-length marble figure of Handel for Spring Gardens, Vauxhall, of which Tyers was the proprietor. The two busts were recorded in the possession of the Tyers's grandson, and then passed by descent to the Reverend Jonathan Tyers Barrett of Brandon House, Suffolk. The busts were sold at the Brandon House sale in September 1919. The purchaser at this sale was Mr R. Levine, whose son, Mr G. J. Levine, sold the terracotta to the V&A in 1927 for £50. The marble bust was sold at Sotheby's on 24 June 1927 (lot 77), but in 1956 it was acquired by the Birmingham City Museum and Art Gallery from Sabin, a London dealer. Jonathan Tyers (1702-1767) was the proprietor of Spring Gardens, Vauxhall, and was responsible for commissioning many works of art both for these entertainment gardens and for his own private estate at Denbies near Dorking, Surrey, whose gardens were devoted to the theme of melancholy. Tyers was a friend of William Hogarth (1697-1762), and also commissioned paintings from Francis Hayman (1708-1766) for Spring Gardens. His commission for a full-length marble statue (museum no. A.3-1965) of the composer George Frideric Handel from Roubiliac was probably given at about the same time that this bust was produced. Here Tyers is shown in casual dress and a soft cap, analogous to the clothes seen in the Handel marble. Subjects were increasingly depicted in casual dress in the 18th century; this often signified their role as artists, or conversely as gentlemen. The sitter is clean shaven and shown full face, wearing a turban cap. His shirt is open at the throat. Classical drapery around shoulders. Modelled in London by Louis-François Roubiliac (born in Lyon, France, 1702, died in London, 1762). Esdaile recorded that this bust and the marble version were in the possession of the great-grandson of Jonathan Tyres, the Rev. Jonathan Tyers Barrett, D.D., who resided at Brandon House, Suffolk, and then passed by descent to the Rev. Wellesley Foley, the great-nephew of Tyer's great-granddaughter. However the vendor noted the name of the former owner of Brandon House was the Rev. William Weller Poley, not Wellesley Foley as noted by Esdaile. According to the vendor, in correspondence prior to the acquisition of the present piece in September 1927, the two busts had been sold at the Brandon House, Suffolk sale, by the nephew of the late Rev. Weller Poley, held in September 1919, and were purchased by his father, Mr R. Levine. They passed by descent to the vendor, G.J. Levine, Norwich, and were purchased from him in 1927 for £50. Levine stated that his father had bought the two busts from the Marquess of Graham sale at Easton Park, Wickham Market, Suffolk, around 1924. However he mat have been mistaken; It was so far impossible to trace the relevant sale catalogues to confirm or deny. Bilbey, Diane and Trusted Marjorie. British Sculpture 1470 to 2000. A Concise Catalogue of the Collection at the Victoria and Albert Museum. London, 2002. pp. 113-114. cat. no. 154. 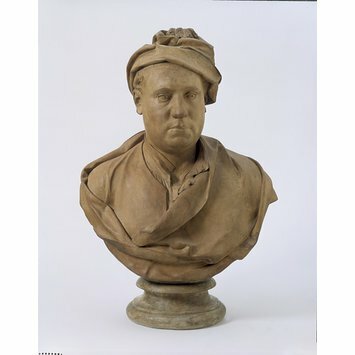 Whinney, M. Sculpture in Britain 1530 to 1830. 2nd ed. London, 1988. p. 200. Whinney, M. English Sculpture 1720-1830. London, 1971. p. 82. Cf. Ruch, J. E. A Hayman portrait of Jonathan Tyers' family. Burlington Magazine. August, 1970. pl. 12.